American film-maker Robert Zemeckis is one big Blue Meanie! 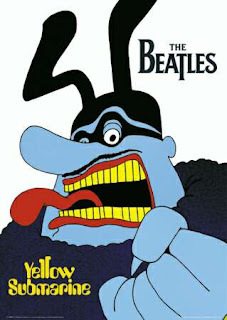 The director responsible for the creepy animation of 'The Polar Express' hopes to use his awful techniques on a remake of the Beatles' trippy animated feature, 'Yellow Submarine.' Variety reports that Zemeckis and of all people -- Disney! -- are working diligently to snap up the rights to the Beatles' tunes used in the original movie. Is nothing sacred? The original 'Yellow Submarine' is SO of its time -- late 60's psychedelia, Peter Max-esque wonderful. Updating the classic Beatles' movie is nothing but a blatant cash grab by Zemeckis and Disney. Once again, Hollywood runs out of viable NEW ideas and starts to mine previous ventures that were fine in their original form, thank you very much. How soon do they forget how off-putting the human characters were in 'The Polar Express.' To quote CNN in their 2004 review: "The Polar Express is at best disconcerting, and at worst, a wee bit horrifying." And now poor George, Paul, Ringo & John are going to get this ill-fated treatment? Performance capture, the technology used by Zemeckis, omits true emotion from its characters -- leaving them wooden, and yes.... CREEPY! I cannot watch 'The Polar Express' without an attack of the heebie jeebies. It's just plain weird. I shudder at the fears of what he's going to do to the Beatles. "Polar Express" came out while I was still in art school. My friends and I were going to a lot of movies, even the ones that seemed silly because we wanted to see the animation. "Polar Express" was a great big "NO" for all of us. I really hope that the remake doesn't happen. A lot of things just shouldn't be redone. Exactly! I couldn't agree more, A.